The kitchen of the title is in a 17th-century chateau called Le Fey, high on a hill in Burgundy. 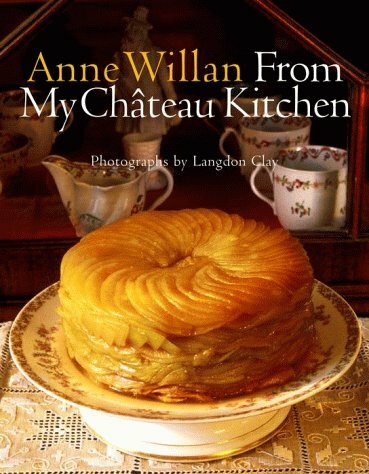 From this vantage point, Anne Willan -- long known as an authority on French regional cuisine, on food history, and on classic French cooking -- has written a personal book, elegantly interweaving chapters on her life in the chateau with journeys out into the surrounding landscape. She examines the work of the people of Chateau du Fey and its surrounding quarters: the gardeners, farmers, vintners, and restaurateurs who live and breathe French cuisine, and who contribute to the character and flavors of the Burgundian table. Foremost in the cast of characters in Anne Willan From My Chateau Kitchen is M. Milbert, gardien and gardener, who will pick no vegetable before its time. But there is also Claude the water man, who looks after pipes and plumbing for both village and chateau, and who figures prominently in the group of local hunters who follow the age-old rules of la chasse. We are introduced to M. Simon, the blacksmith with a network of cellars under a nearby cathedral, where he makes ratafia. And M. Haumonte teaches traditional bread and croissant making using the chateau's wood-fired oven. There is the lady from Morvan who makes 500 varieties of jam, the beekeeper, and the father and son with the traveling cider press. Anne Willan takes us through the countryside, to markets in Sens, to the makers of mustard and spice bread in Dijon, to Villeneuve-sur-Yonne, where Leslie Caron presides over an establishment serving Burgundian fare, and to Joigny, where Lorain father and son reign in 3-star splendor. Anne has chosen to share recipes for the dishes she cooks and eats at home, including such classics as Leek Quiche, Oeufs en Meurette, and Jambon Chablisien. There are also recipes that cope with the garden's staggering bounty, such as Spiced Red Currant Jelly and Gratin of Summer Vegetables in Herb Pesto. Other recipes are brought by the chefs who cook at the La Varenne school -- including Snail and Mushroom Ravioli with Parsley Sauce and Dried Fig and Marc Ice Cream. In almost 300 color photographs and with more than 160 recipes, Anne Willan renders an intimate appreciation of both the food and the culture of Burgundy. As this beautiful and personal book proves, Anne Willan has succeeded marvelously in her chosen (and enviable) task of exploring, understanding, and teaching the art of French cuisine as it manifests itself in one of France's most food-oriented provinces. Which just happens to be her back -- and front -- yard.